Some days flow. 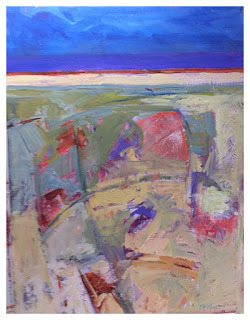 After all the days of struggling with a painting…..the next one just flows. I think that is deserved payback for all the struggle on some of them. Such was the day the day after I finished the Searching painting. To backtrack…. My studio is getting a little crowded in the storage department so I went looking for another old canvas that had been there waaay too long. I found one from my early Little Pieces of Land series……….40 x 30 and no varnish on it so I just painted over the whole thing. It went from a horizontal to a vertical this time around. This picture was just made quickly with my new I-phone camera so I will have to make another later with my SLR. All I can think to title it at the moment is …….Blue Skies. If you have any good ideas for titles, let me know. I hope so, unless there are tiny little adjustments upon more viewing. 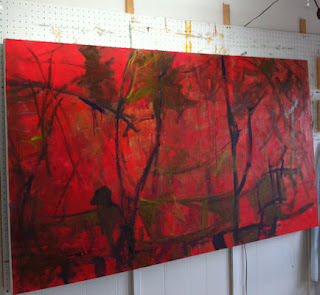 It sure came a long way from a gestural, wild, red under-painting. It seems that some work just demands a lot of searching with the paint, layering, scraping and trusting in your own mode of expression to come out. That’s really always the key…trusting and no fear. Another thing I noted that sure was a continual problem working on this whole painting is the way the paint would dry up on my palettes before I could get very far. AND, if you know me, or have observed me at work, that takes some fast drying. Due to the ‘search’, I am really considering the title to be “Searching”….at least it will hold some meaning to me if not to anyone else viewing it. As you might notice…. I changed my blog template playing around with the new stuff with blogger…not sure about this…what do you think?? Struggle Struggle Struggle……….Some days and weeks are like that and this is one of them. 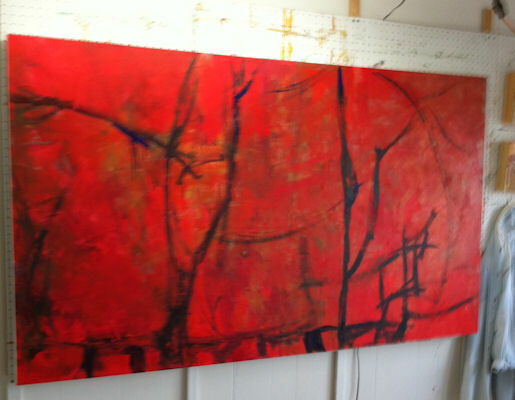 I had high hopes when I started this 36 x 72 canvas and toned it all with red. Only thing is, it suddenly just went south on me and became tired looking all over the center area. So I turned it in a horizontal and proceeded after thinking on it for a long time……just painted all of it out with more red. And we’re talking a lot of cadmium here folks. 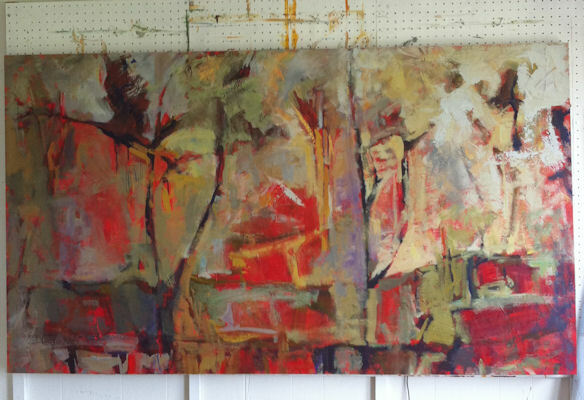 SO, today, back to the studio to make marks or just DO something with this thing. I made marks, I added paint…it started looking like I am surrounded by forest or something plant like.. I don’t want to know what this is. 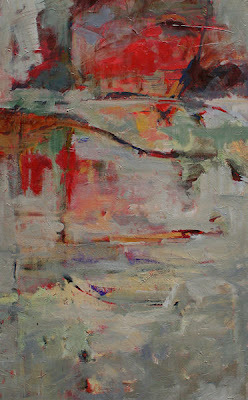 I am not wanting to paint SOMETHING, I want to paint a good painting without a known subject. I think it might look better here in my I-phone pictures than it does when I see it in the studio. So happy I added in all that violet. This is waaay too busy for my taste. 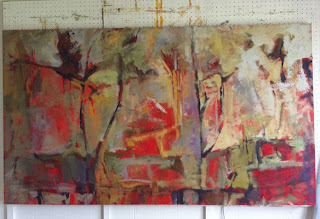 NOW….where am I going to paint out and what color and value, that is the question.??? Sometimes looking at process pictures gives you some thoughts on what you have done right or wrong, or will tell you that you don’t need any more or that you need a lot more. Sooner or later it will come to me but right now it’s hot and I’m tired. I finally got to spend a little time with the Hot-Box I bought from Paula Roland. I really don’t now what I’m doing here, but it should be fun to experiment around. I have a lot of paper in the studio from other projects. 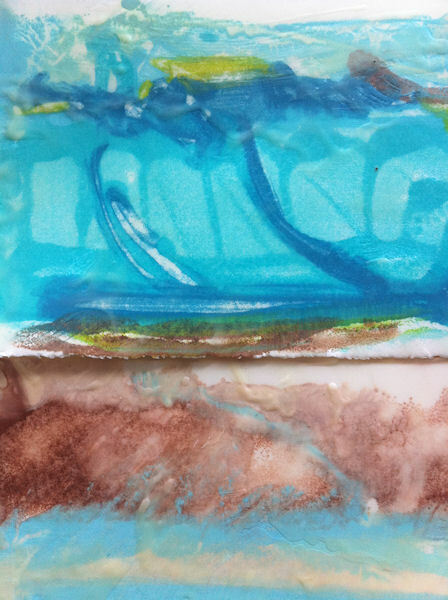 That was another reason for wanting to try this technique of encaustic monotype. I heated up the box to the approximate 160 or so degrees for working. 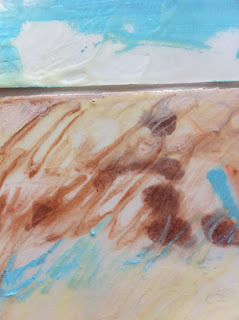 I decided to use some of the new Evans Encaustic colors I bought at the conference…in the wonderfully subtle colors of Hylla’s hen’s eggs. I did add a few other colors ..that beautiful Cobalt Aqua from Encaustikos is the stronger color…and a green from R & F Encaustic. Anyway…. I had some printmaking paper torn up into small sections, so I used it. I took a couple of pictures of the three pieces I think might work out into a piece I can mount on a panel possibly. These are just straight monotypes. I haven’t done anything to enhance them other than brushing some plain clear medium on top to make a good surface. I’ll just lay them aside for now…and consider how I might work back into them. They make me think of sand and sea. This is a picture that takes in one (first one) and a little of the bottom of the second one. Strange but it makes it look like a lovely little land/seascape arranged in this manner. The second picture denotes the third monotype with a section of the middle one below it. It also has another feel to it with this arrangement. The last is a picture of all three monotypes stacked up…If used in this manner, they will need some more work to unify all three into one design. I’m spending part of my Saturday trying to re-arrange my encaustic set-up in the studio. 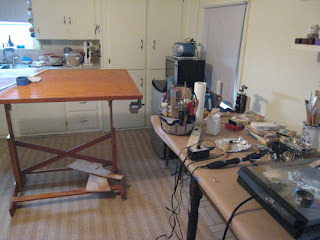 With an 80+ inch door topper to a table and a small porcelain topped cabinet for the Hot Box from Paula Roland lined up under the window, I’m wondering where in the heck will I set up my panels to paint on there is so much ‘equipment’ with power cords everywhere. I have a fan in the window for trying to vent out the vapors from heating the wax so that limits where you can set the melted wax paints. All those short power cords from so much kitchen equipment is also making a hazard to stumble or trip on as you work. I put a couple of crock-pots away as I think I may not need them all the time when I’m working now I have the ‘skillet’. Whoa…did that skillet make short work of making medium. ..yes yes yes…I love it. 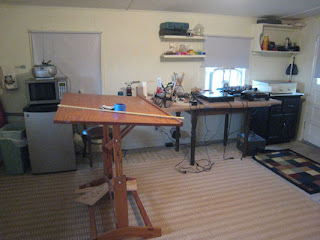 When I started working larger I brought in an old wooden drawing table…about 48 inches wide and raised it up way high so my neck/back wouldn’t hurt from bending over so much. SO, that must be the only place left to paint on. 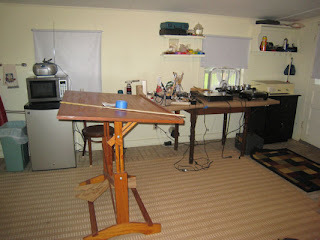 I have it set up perpendicular to the table wall. What I really think I need is a big huge U shaped work area with lots of electric outlets on different circuit breakers and a venting system coming down from the ceiling. What a pipe dream that is. I do have a vent from a dryer that used to be installed there on that wall with the long table. I keep wondering if I can have some kind of contraption made that will let me vent out through that vent…but I haven’t a clue on how to do this. Okay…so the other part of my Saturday…off to the grocery store.